Do you need to share your computer with other family members, roommates or colleagues? Then the most obvious solution would be to have another computer station and avoid tensions when it comes to computer usage. But would you like to have the same functionality without spending a fortune? With ASTER you can double computer power and maximize its functionality with minimum efforts! We offer you ASTER double monitor software allowing you to organize several computer workplaces on the basis of just a single computer system. Actually, our powerful double monitor software is designed to enhance basic PC functionality and provides a number of benefits for home and office users. By using double computer monitors with just a single computer processing unit, you save space in your apartments and obtain maximum functionality at a very affordable price. Moreover, while you double computer power, electric power is saved because of just one system unit usage that is the main source of power consumption in the computer. Don't let dual computer monitors to scare you. Believe it or not, by using our user-friendly ASTER double monitor software, it's very easy to double computer power and obtain another workstation without purchasing any specialized equipment. All you need to start running double computer monitors is a functional Windows operating system, one more monitor, keyboard and an extra mouse. 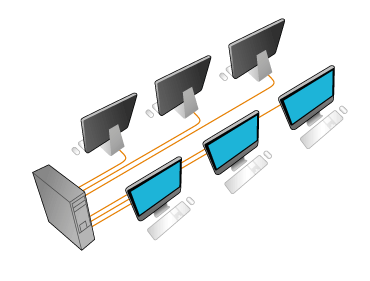 Undoubtedly, using double computer monitors has indisputable advantages over a standard PC that can be used by one person at a time. No more disputes whose turn is to use your home PC - just install innovative ASTER double monitor software from IBIK and enhance computer power without any hassles.